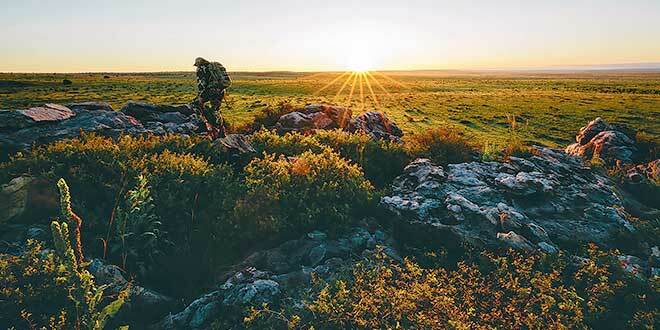 Now a trout biologist, Nathan Wiese muses on the path from his first whitetail hunt as a boy on his grandfather’s farm in Wisconsin, to waiting out a pronghorn buck beneath an immense sky on the New Mexico shortgrass prairie. It is said that Homo sapiens will witness approximately 25,000 sunrises in a lifetime. Of course, people don’t wake for all of them, but the sun still rises and time ticks along to an eventual end. But some sunrises are special. Yes, every day, the sun rises at a mathematically measured time and place and enlivens an amalgam of stratus, cirrus and cumulus clouds predicted with a relatively degree of certainty. It’s still dark and I’m hunkered in the arid short-grass prairie near the Kiowa National Grasslands with my good friend Andrew Miller. Miller carries his camera and all the accoutrements of an ardent photographer. He makes his living with a lens. I carry my .270 rifle, scarred by years of use. Each autumn I strike adventure to harvest free-range organic meat to feed my family. In my pocket, I have a coveted public-draw pronghorn antelope tag. Last night we watched the sun set into a chorus of monsoon showers and lightning bolts; an image still seared in my mind. This is Miller’s first antelope hunt. We have settled down in the cholla cactus near an old arroyo. The dawn is still inky black, but the tips of our rusty windmill landmark are just showing. The windmill marks a water tank, an oasis on the prairie for cattle and wildlife alike. The centurion steel has long since been retired, the water instead delivered by miles of electrical lines and poly pipe. The spire is now only a landmark—at once a reminder of the past, and maybe a symbol of the future. Sitting on the prairie, under the blinking stars, stirs memories from 9,000 sunrises ago. It’s cold, but not breath-stealing like so many of the cold Wisconsin winters of my childhood. A chill seeps into my toes to remind me of when my mother would slip bread bags over my feet to keep them dry, the only Gore-Tex I knew. I remember my father coming in to wake me, a 12-year-old boy, to his first opening-day deer hunt in the North Country. But I haven’t slept all night; I tossed and turned dreaming of a white-tailed deer, the hunt, the excitement, growing up into the tradition. Opening day, always the Saturday before Thanksgiving. A young boy doesn’t give much thought about tradition—but I was hurtled into it by envy of fathers and peers. Half awake, I pack candy bars, hoarded from Halloween bags. I groggily amble to the old Chevrolet. The passenger door is hopelessly mangled, so we slide across the bench seat from the driver’s side. The engine groans to life under the strain of subzero mercury. The drive drags on, but it is only 8 miles to my grandfather’s farm. Short legs struggle behind an invincible father, but finally we arrive to the woods where we will hunt. I’m small, so I skip the broken block steps in favor of the remaining nail spikes and upward I go into the tree stand. It was a real coming-of-age moment I can see now put me on a trajectory to my contemporary role with Gila trout conservation. The past begets the future. The past and present conjoin here, surrounded by prickly cholla on the prairie at first light while I mentally chew on the matter of conservation. The North American model of public ownership of wildlife makes this possible—for a kid in the North Country or a grown man in the West. The antelope doe is at only 20 steps, her eyes boring holes in our cholla cover. Miller’s shutter snaps don’t alert the antelope, but I keep my eyes to the side. There will be a buck. My muscles cramp in the cold. Mere moments stretch into eternities. The sun keeps at its clockwork climb. Big eyes keep us pinned, motionless on the prairie, waiting. Pronghorn have phenomenal eyesight. More antelope materialize in bands of sunlight as if from vapors. Time ticks. The horizon is huge, but our vantage, between the cholla, is narrow. When I see the buck, there isn’t time for rangefinders or second guesses. I fire, and the buck stands. I send a second round with practiced quickness and the same result. The buck is much closer than my first estimate. I resettle the crosshairs and squeeze off the last round as the golden light of the dawn illuminates the ghost of the prairie. Andrew Miller is a freelance photographer that started his work in Glorietta, N.M. and more recently in Denver. He is an avid angler and aspiring hunter with both lens and shotgun. His work capturing the outdoor spirit has been showcased in numerous publications. Photo by Andrew Miller. 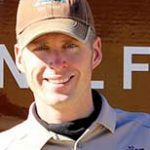 Nathan Wiese is the manager of the Mora National Fish Hatchery in northeast New Mexico, where he and his crew oversee the captive stocks of Gila trout, a threatened species. See www.fws.gov/southwest.